Have you ever felt like someone was micro-managing you? Maybe you work for someone who constantly checks-in for updates. Or, maybe you work for someone who never seems to be satisfied with the work that you submit. Many people complain that their boss is a micro-manager. What many people don’t realize, however, is that their behavior is usually what’s causing their boss to act like a control freak. 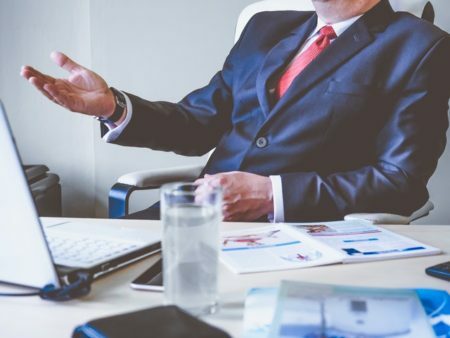 In this article, you’ll learn why someone would micro-manage you, and you’ll learn how you can get them to stop. After reflecting for a few minutes on our time working together, I realized that I was clearly not updating him as often as he wanted/needed. While it was clear to me that I had everything under control, I was doing a poor job of making it clear to him. So, I decided to be more proactive in providing him with unsolicited updates. Rather than merely being reactive and providing him with the latest information when he asked for it, I challenged myself to stay one step ahead of him and to provide updates before he asked for them. As a result of my new communication style, he gradually started giving me more independence. Once I started providing him with proactive updates, there was no longer a need for him to check-in unexpectedly. In a period of months, it was as if I was working for a totally different person. His behavior changed because my behavior changed. Think of the psychology involved in the way that you update your boss and the other people who you work with. When you update people proactively, you send a clear message that you are self-motivated and on top of your work. When your updates are positive, you earn even more points. On the other hand, when you only provide updates when you are asked for them, you make people question how much you care and whether you really have things under control. You make people feel like the only way that you will get stuff done is if they keep checking-in. 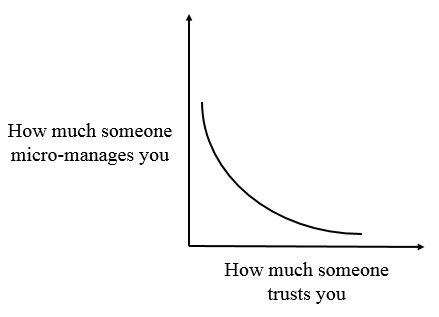 To put it bluntly, there is an inverse relationship between how much someone trusts you and how much someone micro-manages you. The more a person trusts you, the less he will feel the need to micro-manage you. The less a person trusts you, the more he will feel the need to micro-manage you. Not convinced? Test it out for yourself. Think of someone whose work you do not trust at all. Would you feel the need to micro-manage this person on a project? Now, think of someone whose work you trust completely. Would you feel the need to micro-manage that person on a project? How often do you provide this person with unsolicited updates? How often do you tell this person when you will update him again? How often do you follow-through on promised updates and other commitments? How often do you submit quality work that is free of errors and omissions? Unless you answer “always” to each of these questions, you should expect to be micro-managed. If you aren’t staying one step ahead of your boss, following through diligently, and submitting excellent work that is accurate and complete, then you are actually telling your boss that he needs to behave like a control freak around you. How often should you update someone who is micro-managing you? You have to use your judgment here. Once a week (or less often) might be sufficient for some people or for certain projects or times of year. For other people, projects, or times of year, more frequent updates might be necessary. Like anything, managing expectations is a skill that you develop over time. The longer you work with someone, the better you will understand how often you should update the person. Regardless of your boss’s communication preferences or the kind of work that you do, you could send your boss a proactive update at the end of each week. On Friday afternoons, send a brief email with a summary of your progress over the last week, the current status of your projects, and your plan for the following week. This weekly habit serves two key purposes. First of all, it demonstrates to your boss that you are self-motivated and on top of your work. Few people do this, so it will really help you stand out. Most of your peers are probably leaving your boss to wonder what they accomplished over the last week and what they plan to do the next week. Secondly, this practice serves as a weekly accountability check for you. Knowing that you have to send an update at the end of each week reinforces your motivation to make progress on your goals and projects each week and to set goals for the upcoming week. This leaves you nowhere to hide, and it will increase your performance exponentially. Even if the person who is micro-managing you is truly a control freak, you have more influence on how he treats you than you might realize. When you provide unsolicited updates (and when you follow-through diligently and submit high-quality work), your supposed micro-manager might start behaving very differently around you.